Companies who are not improving customer engagement with a mobile app, are losing out big time. There has been a rapid shift in the way businesses strategize their outreach to customers. Most have already moved to a mobile app from a website, or at least have gotten onboard both. Mobile apps usage is skyrocketing every day and shows no signs of slowing down. The number of smartphone users globally is expected is forecast to reach around 2.5 billion in 2019. Businesses that leverage mobile apps for their business expansion will see unprecedented growth in the years to come! Out of all mobile app platforms available with us, Android stays the most widely used, hence presenting a unique opportunity for business owners to reach a majority of their users through a single app. As of the third quarter of 2018, there are 2.1 million apps Android users can choose from through Google Play Store. We are sure that number has increased as we write this piece. Android mobile development is so crucial for businesses wanting to expand their reach to a wide user base. Build your brand with a leading mobile operating system platform and reach millions of users across geographies. Achieve a high ROI with reduced costs. The Android SDK is easily available to facilitate Android app development. Developers can use material design from these SDKs to build interactive and intuitive mobile apps. Developers are only required to pay a one-off fee for application distribution after which, they can use any computer device to build and test apps for smartphones, ensuring low cost and increased user engagement. For companies that want a quicker go-to-market for their new idea, Android app development is the best option. Android apps have a rapid development cycle that typically lasts a few hours. Reduce Time to Market with Android smartphone app development. With Android Studio, the OS became more flexible and scalable. It integrates across the entire Android ecosystem including tablets, smartphones, wearables, and Android TV. This is also one of Android more significant benefits. Android P, the OS’ most recent version, introduced a lot many built-in security features that guard mobile apps against malware and viruses. Using Android security best practices, companies can take a secure approach to Android app development. Since Android is an open-source platform, it comes along with tons of customization features so that companies can get what they want in their mobile apps. With over 86.8% market share, Android is no doubt the leader in the mobile app development market. Leverage its benefits and expand your business’ global outreach. 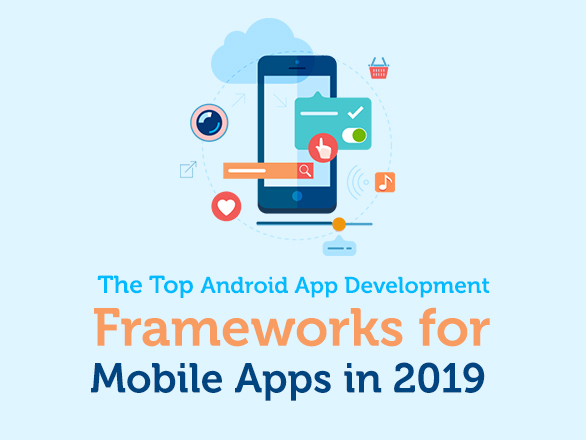 Flutter – This framework came unannounced and secured its place in one of the highly preferred mobile development frameworks for Android. Flutter is a unique framework as it uses a 2D rendering engine popularly known as Skia to create astonishing visuals. These visuals resemble Material Design and Cupertino style widgets, are not either. The benefit of using this framework for Android app development is the ease of testing it offers. It allows app testers to continue working without having to restart a project when an error occurs. This saves significant testing time and allows developers the peace of mind while testing an Android application. Flutter is backed by Google which multiplies its reputation since Google has always been particular about the quality of products it supports. Flutter lets developers build cross-platform apps for iOS and Android using a development language Dart. Kotlin – Since Java involves a steep learning curve, Kotlin came around as the second official development language for Android. Kotlin does not need developers to have a vast knowledge of coding as they enter the arena. The community support for Kotlin is less but growing at an unparalleled rate. The benefit of Kotlin is that it is interoperable with Java. Since Kotlin also uses the JVM, codes in Kotlin can execute as Java code. A number of frameworks facilitate smooth Android app development for beginners using Android and Kotlin. Xamarin – Used by well over 1.5 million users globally, Xamarin has been a special choice of Android app development framework for developers. The framework is a godsend for C# enthusiasts who also want to develop Android apps (without having to learn Java). It offers mobile app developers with an entire set of C# codebase to create native apps not only for Android but other OS too. Xamarin for Visual Studio is another offering used by Android mobile app developers to create native apps using .NET codebase. Corona SDK – This framework for Android app development promises 10-times faster game and mobile app development. This is possible because of its backend framework that lies entirely on Lua, a lightweight multi-paradigm language with a focus on portability, speed, ease-of-use, and extensibility. Corona SDK works on both Windows and Mac OS X, is free, and supports real-time testing. Regardless of the mobile app development framework you choose, keep an eye out if you can find a better one to suit your purpose. Always make it a point to work with the best mobile app development company to get your mobile app developed with the right framework, features, and functionalities. Cross-platform mobile app frameworks are extremely volatile with new and fresh ones launched regularly. Their purpose is to help you put a new idea into a working app ASAP and the working app into a polished product. CDN Solutions Group is a reliable partner working with offshore companies to get their mobile app idea off the ground and turn it into a working, business-facing, growth-focused mobile app. We help you chalk out a roadmap for mobile app development so that the returns you get from your investment are beneficial to your business in maximum ways. We optimize your mobile app from the usability, scalability, performance, security, and experience point of view. Our expert team of developers and UI/UX designers put the perfect elements to derive maximum customer engagement from your mobile app. Whether it is a customer-facing mobile app or one you want to use internally, we can bring out the best for you with the right combination of technologies and the latest mobile app development frameworks for Android. Speak with one of our expert consultants today!